Large with a firm texture and superior flavor. This richly colored fruit is a great addition to any home orchard. Ripens early September. Long-time favorite white-fleshed freestone. Sweet and juicy, aromatic, low in acid. Very high-scoring in taste tests. Ripens mid-July in Central Calif. Widely adapted: (low chill requirement, yet not early blooming). 250-300 hours. Self-fruitful. Popular yellow freestone large fruit is sweet, low in acid, with a mild, refreshing flavor. Mid to late June in Central Calif., earlier in low desert climates. 5-6 ft. tree. Chilling requirement very low, 250 hours or less. Self- fruitful. Very late season yellow freestone. Large red-skinned fruit ripens late September to early October in central California. Vigorous, productive tree. Estimated chilling requirement Estimated chill requirement: 500 hours or less. Self-fruitful. Light red over cream skin, white freestone flesh. Fruits are large, sweet, low in acid, and have a mild, pleasing flavor. Harvest early August in Central Calif. Estimated chill requirement: 400 hours or less. Self-fruitful. Pat. No. 4865. Firm, yellow to red highly colored variety for late season. The fruit is yellow-fleshed, freestone, and shows considerable red around the pit. This is a vigorous, productive tree that has fair tolerance to bacterial spot. Good for canning and freezing. While many varieties have better color than Cresthaven, its flavor is one of the best and many people raise it still for farm markets. One of the earliest yellow canning clingstones, and one of the best-flavored. Enjoy fruit that has also been called 'an excellent dessert peach'. Self fruitful. Ripens in August. 800 chill hours. Also called Saucer or Peento Peach. Unique white-fleshed fruit with a sunken center (shaped like a doughnut). Sweet, with a mild flavor described by some as almond-like. Ripens late June to early July in Central Calif. Estimated chill requirement: 200 to 300 hours. Self-fruitful. Famous yellow freestone. Classic, rich, peach flavor: high-scoring in taste tests. Use fresh, canned, cooked. Ripe late July/early August in Central Calif., up to 3-4 weeks later in colder climates. Self- fruitful. Estimated chill requirement: 600 hours. Fine fruit for the very late season. Very large, yellow freestone, excellent flavor. Mid-September in Central Calif. Early bloom. Estimated chill requirement: 400 to 500 hours. Self-fruitful. Popular yellow freestone: juicy, moderately sweet, flavorful. Fresh/can/freeze/dry. Ripens 1-2 days later than Elberta in Central California (August 1st), but blooms earlier. 700 hours. Self-fruitful. Very large flavorful fruit. Firm, hold well on the tree. Heavy yields, good for home orchards. Self-fruitfull yellow freestone. Ripens mid to late July. Also called the Paul Friday 007 Peach. Large and round. Red over yellow skin. Smooth texture and highly flavored. Heavy producer. Self-fruitfull yellow freestone. Ripens in late June-Early July. Large yellow freestone, similar to its parent J.H. Hale - excellent dessert quality. Ripens late July in Central California, 1 week before Fay Elberta. 700 hours. Self-fruitful. Resistant to peach leaf curl (10-year trials at Washington State U.). Delicious yellow freestone. Slight red blush over greenish yellow to yellow skin. Heavy bearing, excellent for canning or eating fresh. July. Showy pink bloom in spring. 700 hours. Self-fruitful. Light cream skin with attractive red blush. Sweet taste with a nice soft aroma. Saucer or doughnut shapped peach. Self-fruitful white freestone. Ripens in mid to late June. Earliest top quality peach. Yellow semi-freestone with exceptional flavor. Mid to late June in Central Calif. All-purpose, superb for eating fresh. 550 hours. Self-fruitful. From a cross of J.H. Hale and Redhaven--Winter & frost hardy. Large, red skin, excellent flavor, freestone, mid-season. Dessert/can/freeze. 900 hours. Self-fruitful. The number one cling peach in California. Very good quality and quantity. Great for cooking or canning. Self-fruitful yellow clingstone. Ripens in late August to early September. Large, clingstone fruit with dark crimson skin and flesh. Distinctive, tart flavor when fully ripe. Makes beautiful and delicious pickled peaches. Excellent for eating fresh, pies and preserves. Requires a pollinator. High yielder, dependable. Ripens in July. Taste test winner: one of the all-time highest-rated fruits at Dave Wilson Nursery fruit tastings. Large, firm freestone with crimson and cream-colored flesh. Tart until fully ripe, then highly aromatic with a rich, distinctive flavor. Highly resistant to peach leaf curl. Late season. 700 hours. Another peach needed to pollenize. Old variety, still one of the best. Very large, firm, superb flavor. Fresh/canned. Ripe August 1st in central Calif. Excellent frost hardiness. 800 hours. Another nectarine or peach needed to pollenize. Also called Early Elberta. Reliable heavy crops. Juicy, sweet, very flavorful yellow freestone. Very high-scoring in taste tests. For canning, freezing, or fresh use. 500 hours. Self-fruitful. Great tasting white peach. Attractive fruit with sweet taste. Good home orchard variety. Self-fruitful white freestone. Ripens in late July. Juicy sweet white peach. Good quality and firm texture. Self-fruitful white freestone. Ripens in mid June. Kaweah With consistent high fruit pack-outs, the Kaweah peach is an excellent yellow-fleshed freestone that is harvested at the end of July and into August. This selection is suitable for freezing and demonstrates good shipping qualities. The Kaweah variety presents good size (2-7/8" to 3") and high color (80% to 85% red over yellow). 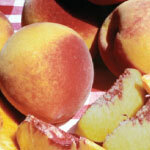 The Kaweah peach provides a flavor that is a nice balance of acid and sugar. This peach has a chilling requirement of 900 to 1000 hours. Patent #10177. Resistant to peach leaf curl. Large yellow freestone with dense flesh and rich, sweet, distinctive flavor. Excellent for drying, canning and fresh use. Harvest in late July in central California. Discovered on John Muir's property in California around 1880. Estimated chilling requirement: 600 - 700 hours. Self-fruitful. One of the finest white peaches. Medium to large fruit with dark pink blush over a beautiful cream to pale green background. White freestone flesh, tinged with red, is sweet with exceptional flavor and aroma. Harvest three weeks before Elberta. Originated in Bakersfield, Calif., introduced in 1935. 800 hours. Self-fruitful. Popular fresh market yellow freestone now available for home planting. Large, firm, full red skin, superb flavor. Ripens early to mid-August in central Calif. Strong, vigorous, heavy bearing tree. 750 hours. Self-fruitful. Large, yellow canning clingstone. Firm, juicy, distinct vinous flavor. Harvest late August in central California. 800 hours. Self-fruitful. Flowering/fruiting. Large, juicy, firm, richly flavored yellow freestone fruit. Showy double red blossoms. Mid-July. Low chilling requirement, 250-300 hours. Self-fruitful. Pat. No. 4195. World's most widely planted peach. High quality yellow freestone. Ripens early July in central California. Frost hardy. Fresh/freeze. 800 hours. Self-fruitful. Favorite late yellow freestone. Large, sweet, rich flavor, like J.H. Hale. Fresh/freeze. Small tree. Showy bloom. Mid-August in Central Calif. 800 hours. Self-fruitful. Sport of the the very popular O'Henry Peach but ripens 2 weeks earlier. Great plavor and very attractive fruit. Good Yields. Also called "Early O'Henry Peach." Self-fruitful yellow freestone. Ripens early-mid August. Long-time favorite white freestone peach for California. Very sweet, aromatic, juicy, with superb, delicate flavor. Early to mid July in central Calif. Highly recommended for home orchards. 4-500 hours. Self-fruitful. Fine late season yellow freestone, ripens approx. Sept. lst in Central Calif. Large, sweet and flavorful. Used fresh, canned, and for freezing. 700 hours. Self-fruitful. A favorite fresh-market variety. Large, very firm, fine-flavored, yellow freestone. Bright red skin over yellow. Suncrest is the peach immortalized by the book Epitaph for a Peach: four seasons on my family farm , by David Mas Masumoto (1995). Tree-ripe harvest late July in Central California. Frost hardy blossoms, consistent producer. Originated in Fresno, California, introduced in 1959. Estimated chill requirement: 500 hours. Self-fruitful. Flat "donut" shaped fruit with yellow flesh and classic peach flavor. Has large fruit & sets heavily in Central California. Estimated chill requirement: 300 to 400 hours. One of the oldest varieties still available is an American variety (New York-1760).It is a late-ripening (September), white-fleshed, clingstone with a rich, unique flavor. It requires 500 to 600 hours of winter chill and is hardy and vigorous. New Peach X Nectarine Cross. Sweet- low acid. Melts in your mouth. Self-fruitful white freestone. Ripens in late May to early June.